One hero towers above all others in the Hyborian world. Black-haired, sullen-eyed, with gigantic melancholies, this is Conan. Barbarian, thief, pirate, raider, mercenary, hero --- but above all, a Cimmerian! 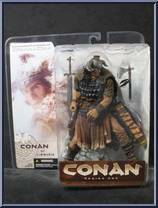 Conan was born amid the carnage of battle as his tribe fought off a Vanir raiding party. The territory claimed by his clan lay in the northwest of Cimmeria, and although he is a purebred Cimmerian, Conan is also of mixed blood. His grandfather was from a southern tribe but was exiled by his people due to a blood-feud, eventually finding refuge in the north. Having taken part in many raids into the Hyborian nations before his exile, he told tales of these softer countries to a young Conan, who vowed to one day see these storied realms for himself. 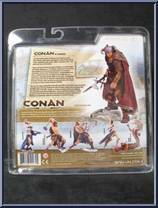 The son of a village blacksmith in the grim gray hills of Cimmeria, Conan honed his strength and prowess by hunting the wild mountain beasts and competing with the other boys in his tribe. At age 15, already standing 6 feet and weighing 180 pounds though still not fully grown, Conan received his baptism of battle as part of a host of Cimmerian clans that attacked the garrison settlement of Venarium, an Aquilonian. 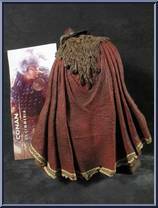 Contribute pictures, update details or suggest corrections for Conan of Cimmeria. 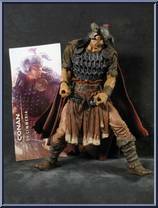 Write a review about Conan of Cimmeria.